Here at Pro.. err.. Ponytagonize, we’ve always had a major hankering fierce, burning love for all things pony. You may not have realized it from the start, but we’re all about the ponies. And I’m not talking laying bets at the track, either. “Why ponies,” you ask? Well, why not ponies? It is without further ado that I present to you, our dear authors, our new and fantastically awesometastic redesign. We also invite you to check out our new featured group, as well as this week’s Editor’s Pick… not to mention, our featured author pony! We hope you find the new design eye-catching and all-around ponygasmic! 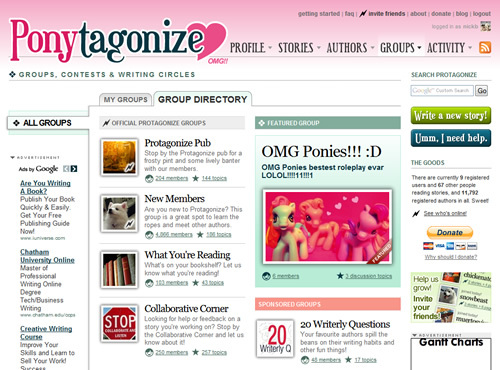 This entry was posted in Events, General and tagged awesometastic, pink, ponies, redesign. Bookmark the permalink. 13 Responses to We heart ponies!! Nick, this is awesome. Major chuckle of the day. Argh! Why isn’t my earlier comment showing up? Two question! Is this a joke? Will protag…. I mean ponytagonize go back to being protagonize. Not that I have anything agianst ponies! Just wondering. I had a mental breakdown when I saw this. This is all for April Fools, right? holy snap! I can’t believe I missed the ponies. I nearly died laughing when I saw this come up… Nick, you have cost me my last shred of dignity when my entire dormitory turned around to see me laughing hysterically at this. or d) on April 1st and not March 30th like I thought. I think we all know which one was right.